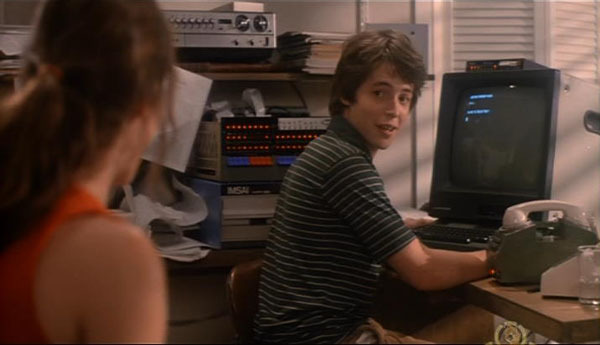 The best-known application of an HP 9845C outside the scientific and engineering scene probably was John Badhams "WARGAMES" from 1983. The story is about David Lightman (starring Matthew Broderick), a high school student and computer hacker, who uses his IMSAI equipment to break via the public phone system into the high school computer in order to adjust his school grades. One day he logs into an unknown computer system via backdoor password, not realizing, that he is in a NORAD military artificial intelligence computer system called WOPR, which, as an attack detection and response control system, is connected to the ICBM nuclear weapon system of the U.S. Assuming it is a kind of computer game, he initiates a "thermo nuclear war" scenario, which leads NORAD to believe the U.S. is really under attack by a soviet nuclear strike. In the very last moment, World War III is prevented by showing WOPR, that in a thermo nuclear scenario, no "player" can win, independent of whether he strikes first or responds to a first strike. The movie was technically brillant and commercially successful, and - although the IMSAI 8080 shown in the film already wasn't state of the art any more - became famous for the hacker techniques shown in the movie. However, there were also other computer systems invloved which are the "hidden stars" of WARGAMES. A considerable share of the movie budget was spent on building the impressive NORAD set, and one of the most important features are the large projection screens which were used for operation controls. All computer graphics visualization projected on those screens were produced with an HP 9845C system. This was due to the fact, that Colin Cantwell, responsible as a consultant for the computer graphics design, also had a relationship to the Hewlett-Packard company, who then lent the 9845C system for the production of the screens. 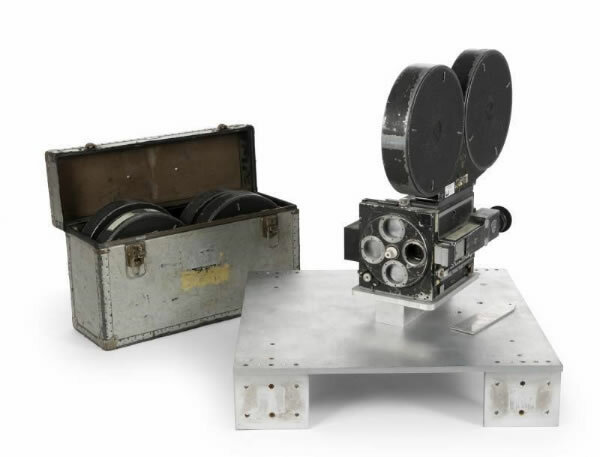 The special effects team built their own film recorders and file management system to control the production of about 50,000 feet of negative material. Note that Colin already played a role as part of the development team of the 9845C (see the history section). He obviously had a strong relation to both visual/special effects and computer design. Before his engagement in the WARGAMES movie, Colin produced special effects in 1968 for "2001 - a Space Odyssey", and did some space craft design for George Lucas' Industrial Light & Magic in the first "Star Wars" movie (remember the X-Wing, Y-Wing, TIE and Death Star?). "In motion-picture production, a color graphics computer like System 45C can serve as an electronic storyboard, simulating complex animation and special effects before any film is shot. We've chose to illustrate this application on our cover, and we thank Lucasfilm, Ltd., for the background shot." "Having actually repaired the 9845 that was used during the filming of War Games, I can provide a little background on how it was done. The 9845 was used to generate the images up on the big screens in the background of NORAD. These were all created prior to the movie being shot and recorded onto film for projection later. 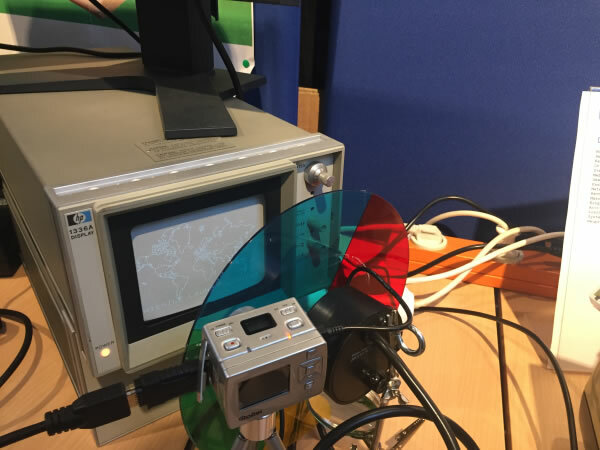 The resolution on the 9845 display was not high enough for recording or projecting, so the frames were created one at a time on a high resolution vector display and recorded onto film. The display was monochromatic, so color separations had to be done and filters were rotated in front of the camera. If I recall correctly, each frame took about 1 minute to produce. I don't remember what display they were using for War Games, but I'm sure it was driven by HP-IB and appeared as a plotter to the 9845. HP, at the time, sold high-resolution vector displays that worked that way. Later, we introduced a color version, that used phosphor applied in layers, so that depending on the beam voltage, different levels of penetration into the phosphor layers would create different colors. The only down-side was that it was noisy (a buzzing sound was created from the high-voltage switching constantly), and not very bright. They attempted to use one in the movie "Raise the Titanic", which also had a 9825 in it, but decided it wasn't practical." "Graphics on the large NORAD war room screens were rendered in advance by an HP 9845C desktop computer running BASIC. In 1982 the 9845C was comprised of a base with built-in keyboard and a 14" color monitor that mounted on top. Cost of a 9845C was about $90,000 (inflation-adjusted) and the entire "desktop" computer weighed about 100 pounds. The computer's resolution was not good enough to project on a large screen or to be filmed from directly, so a high-resolution monochromatic display was connected. The images were filmed from the display, one frame at a time, one color at a time, using filters for red, green, and blue. The process took about 1 minute per frame of film." 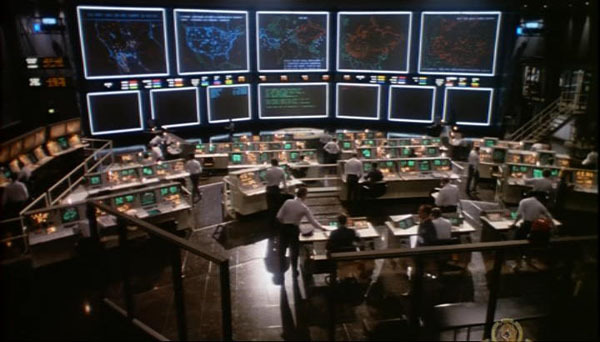 "In 1981, on WarGames with Colin, we printed out books of images (dot-matrix, still) representing the screen wall in the NORAD war room, showing the progression of the action through the scenes. Colin produced all the graphics for the film on HP 9845C computers, which also did the previsualizations books. This was a complex task. We had images on 12 screens covering five weeks of shooting, all working in sync with each other. Completion of this without digital technology, and without Colin’s book, would not have been possible. There are only a few visual effects shots as you would normally think of them in Wargames. Of those, the most notable are some miniature missile silo shots. But, to avoid composites for a great portion of the film, I supervised the large screen map displays on the 12 main screens in the war room, in addition to the graphics on the 125 monitors. The images were created on Hewlett-Packard 9845c’s by Colin Cantwell, and recorded on to film on purpose-built film recorders of my design. These used vector displays to create the images which were were recorded on motion picture film with Mitchell 35mm cameras. We generated something like 50,000 feet of computer graphicly created negative in 7 months or so, running 24 hours a day, seven days a week. We printed nearly 130,000 feet of film for the process projectors that put the images on the screens. The screens were specially built from a custom material for the film. All cameras, projectors, computers, and video were synchronized by a custom system (everything was custom in 1982) which kept all the images on the right frame at the right time in the right scene. On top of that we had to create the worlds brightest 24fps strobe system for the end sequence, which was controlled by another synchronized computer system. It was the first film to have real time 24fps computer graphic displays (as crude as they now seem)." "Computer security is making headlines around the world. (See story on page 16 by staffer Betty Gerard about HP's own efforts in the field.) But HP also helped dramatize the problem through a supporting role in the movie "War Games." In the spectacular closing scenes of the movie, tension builds in the makebelieve U.S. defense command post. Wall screens and computer terminals around the room flash with the changing pattern of approaching enemy nuclear missiles. It's all a skillful illusion created by computer graphics consultant Colin Cantwell, using four HP 9845C desktop computers along with other HP equipment. Colin and his firm, Crystal Chip, spent 10 months on the project, which was a critical part of the film's dramatic action. He designed and programmed half a million frames of computer graphics, which were then reproduced on film and projected onto screens behind the actors on the war-room set. What appeared to be 12 large animated wall maps were actually images beamed from a battery of synchronized movie projectors located off-camera. The many small terminal screens showed similar images that had been transferred to videotape. The multiple images had to mesh with the dramatic action, so Colin first used the computer to draw 100 pages of storyboard in order that the director could view the overall effect of the proposed graphics display at any given point in the script. The final images were all created on a single design station using a desktop computer connected with an HP 9874A digitizer on which the drawings were done. The large size (up to 18 feet) of the war-room screens meant the computer graphics had to be photographed from a very high-resolution vector display (the HP 1345A) driving an HP 1336A display tube. The huge mass of drawings was stored on an HP flexible disk drive, then played back-one frame at a time-by three other desktop computers, each connected to a motion picture camera by a 16-bit interface. These computer-controlled camera stations usually filmed three to four frames a minute, 24 hours a day, seven days a week - slowly exposing the 17,000 frames of computer graphics required for each minute of action on the sound stage. "Under the gun of such time pressure. it was important to use a computer system that was trouble-free and could evolve the perfect version of a picture as rapidly as possible." Colin says. Colin, who designed the original models for "Star Wars" among his other screen credits, has long been an admirer of the 9845C. As a consultant to HP, he did the graphics for the original demonstration package for the desktop when it was introduced in 1980." If you ever asked yourself what kind of magazine David Lightman read in the very beginning of the movie you might want to follow Michael Walden's research story on http://mw.rat.bz/wgmag. Michael also did an amazing job to get together a great collection of links on that movie. "Klaus, thanks very much for donating the equipment to us, but the question which moves us all is: how did you manage to acquire those precious goods?" Klaus: "Well, in fact it was - as always - a matter of luck. Guess we all know the movie, and the impact it had for a whole generation of nerds diving into the world of hacking. Now, actually it was a friend of mine, who knew that I was interested in everything around vintage computers, who gave me the key hint. We must take into account, that the original equipment in fact was believed to be completely lost. But the friend - who was frequently visiting those halls where lots of old computer scrap gets stored - about four weeks ago called me up and told me there is an IMSAI in near perfect condition that I might be interested in. 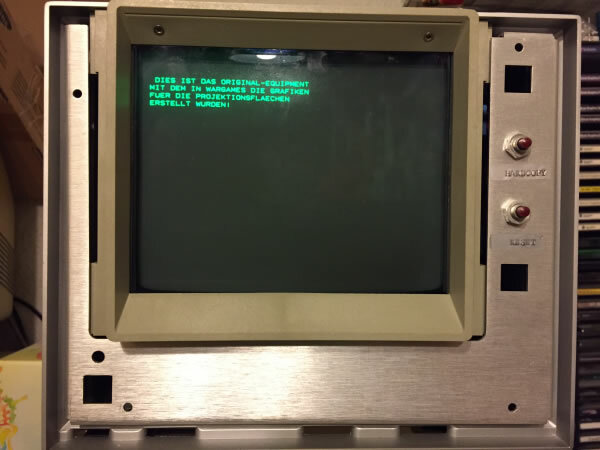 Now we all know, that the IMSAI actually is a clone of the original Altair, so I showed medium interest. But finally went to that storage and immediately got the flash. It was all there - the system, the floppy, the monitor, the modem, and the speaker which was used in the movie. Even the post-its, where David Lightman alias Matthew Broderick noted down the passwords. Unbelievable." "So, how much did you spend on it, can you tell us about this?" Klaus: "Let's say, it had been a kind of a bargain. Obviously no one had been aware of the relevance of that stuff. However, I told the owner of the movie and the value of the equipment for collectors, and asked him whether he can tell about how the equipment made its way to the store. The owner - who is a great guy by the way - unfortunately didn't know anything on the history, since he took over the warehouse from the previous owner who stopped business. But he told me for him it is scrap in any case, and if it makes me happy he will make a good price for me." "And then you fortunately decided to donate it to us.."
Klaus: "Well, you know, I love your site. 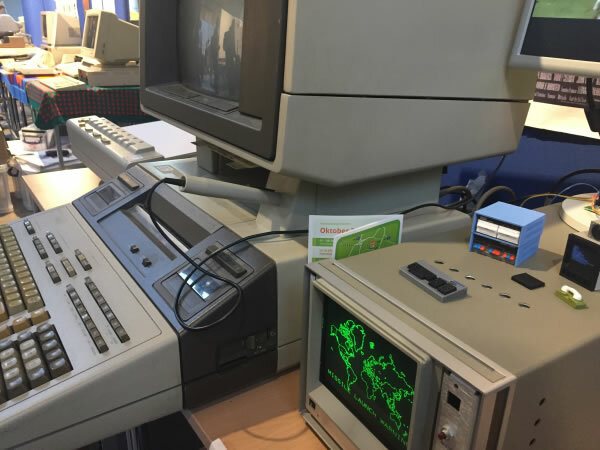 It is made in such a professional way, and it is an invaluable source for many of us who care about the times, when computing wasn't as standardized as it is today, and there still was a chance to gain full understanding of a single system. So, I'd like to support as far as I can, and I am happy to help in preserving the milestones. And this collection of IMSAI equipment definitley needs the right hands to care for it." "Thanks Klaus for the short interview, and hopefully see you again soon." The interview was taken in June 2017. Actually, don't take it too serious, the story is fully fictitious, as is the interview, and the adorable wargames items are created with a 3d printer and have been elaborately hand painted. Thanks Klaus for the really great gift, this is so cool! If someone is interested in those micro wonders, check out www.rabbitengineering.com. 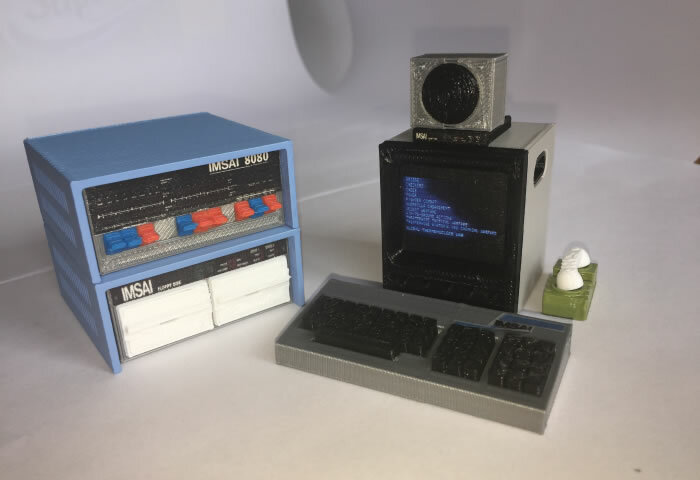 Ok, we were kidding a bit with the IMSAI equipment, but isn't it nice? However, in fact I really managed to acquire the original equipment used for creating the graphics for the amazing giant projections in the NORAD set. The story behind it is that Colin preserved all that equipment from the original take in 1983, and sold his collection (together with his collection of Star Wars props) in 2014 as part of an auction at Julien's (see this link for the original auction). There is a great interview done with Colin where he talks about his role in the creation of WARGAMES on originalprop.com by Jason DeBord (see this link for the full interview) before he sold the equipment. Actually, Poul-Henning gave me the hint in December 2016 that the original equipment was offered by Prop Store in LA (see propstore.com). Which again got the equipment from an auction at Julien's (see this link for the Julien's press release in 2014). This was HOT. In total, four items were offered, the original Mitchell 35mm Camera, the 1347A Vector Generator, the 1336A High Resolution XY Display and the 1336S Power Supply for that display. 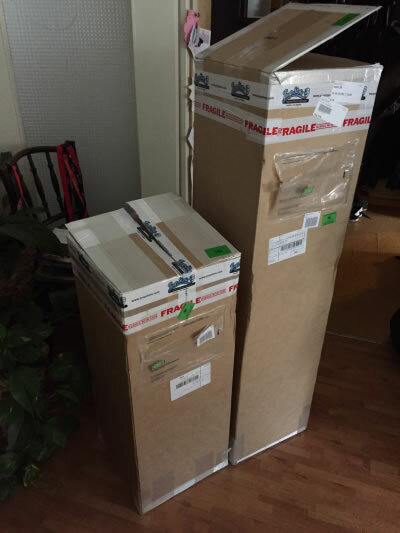 However, I hesitated a couple of months because the shipping costs to Berlin would require a small fortune. Apart from the risks to get the equipment damaged during shipment. Checking again in 2017 it showed that the Mitchell Camera already was gone. Finally, in August 2017 I decided to place an order on the three remaining items, and a couple of weeks after I received a bundle of two giant packages, perfectly protecting the precious content with lots of padding material. The devices showed up in quite good condition, exactly like those in the interview. Luckily I got the ones Colin once used for the authoring (the XY display with the black bezel, all the others used in the batch run have a white blind). 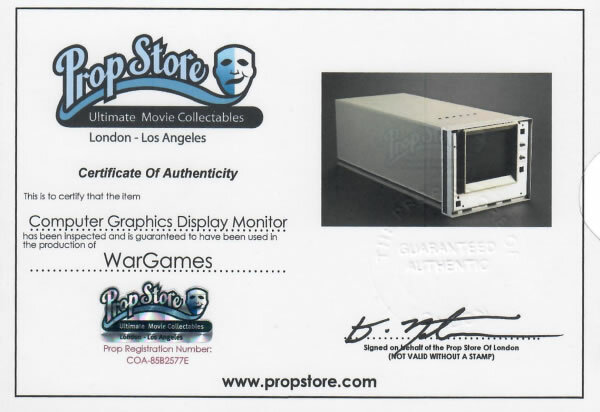 The original labels from Julien's auction where still there, and the Prop Store also always includes a certificate of authenticity for every item. 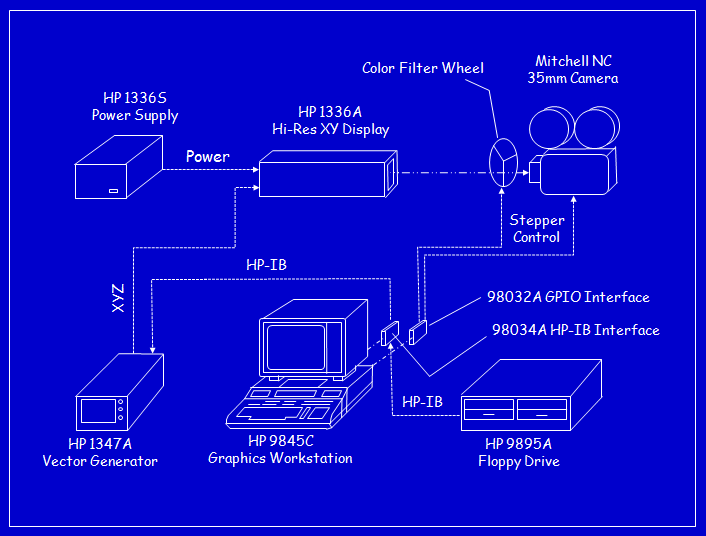 For the creation of the graphics in WARGAMES also HP 9845C workstations with 9895A floppy drives had been used, which, however, were just lent, and returned to Hewlett Packard after the production was done. Fortunately, I own those type of workstations, so I could complete the setup with my already existing equipment. Being extremely cautious not to damage the devices I did not yet connect them to the power line, but first did a deep inspection on everything, including the power configurations and the schematics. Fortunately, at least some of the manuals can still be downloaded from the Agilent website. The special power cable for connecting the 1336A to the 1336S was missing, so I had to do some research on where to get the special connectors required for that cable (and found them at Digi-Key, MN). It showed that both the 1336S and the 1347A could be operated also with 220V/50Hz, if configured correctly. I also had to get some 58 Ohms coaxial cables with BNC connectors to connect the 1347A Vector Generator to the 1336A XY Display. Now that the vector hardware was complete, I tried to switch them on. Bonk, a small cloud and the 1347A display didn't show any sign of life. What happened was that HP used a low voltage switch as a power switch for the prototype, which wasn't specified for 220V, and both the switch and the fuse were blown. Ok, got a replacement, and just to be sure, used a 220V/110V step-down transformer for the 1347A. I also had some trouble with DIP switches, which could be solved with some contact cleaner spray. Does anybody know about the teddy on the PCB? Yes, it is gold plated! Now the vector generator got to life, and started showing a test pattern, which again was duplicated to the XY Display. This was cool. No complaint on any defects during power-up test. And the difference between the display on the vector generator and that on the XY display is amazing. The 1336A XY Display creates an unbelievable fine vector drawing, I guess impossible to reproduce just by taking a photograph. Next step. Program the vector generator so we can show our own graphics. The basic instructions are described in the 1347A programming manual I downloaded before from the Agilent website. 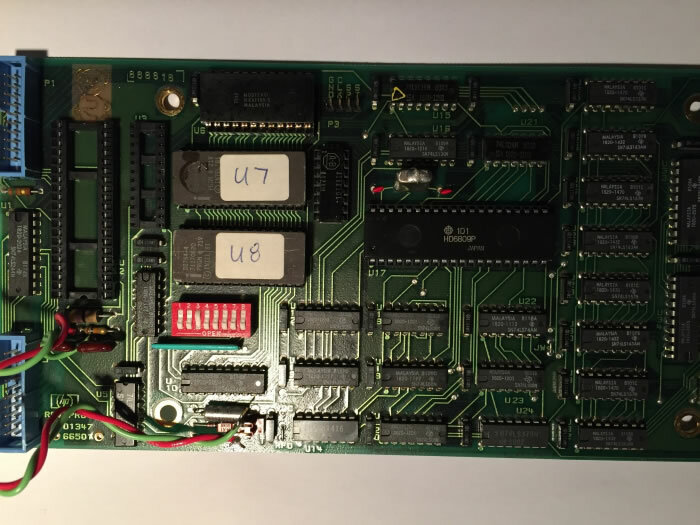 I first connected the 1347A to a HP 9845B Model 200 via 98034 HP-IB interface, and just hacked in one of the programming examples from the manual, and it worked! Actually, the 1347A accepts ASCII commands which are an extension of the HPGL language. Scaled to a 2048 by 1513 coordinate system. Those commands get interpreted by the built-in microcontroller, and then transferred as raw data to the internal 8K vector memory. Ok, we have everything we need. 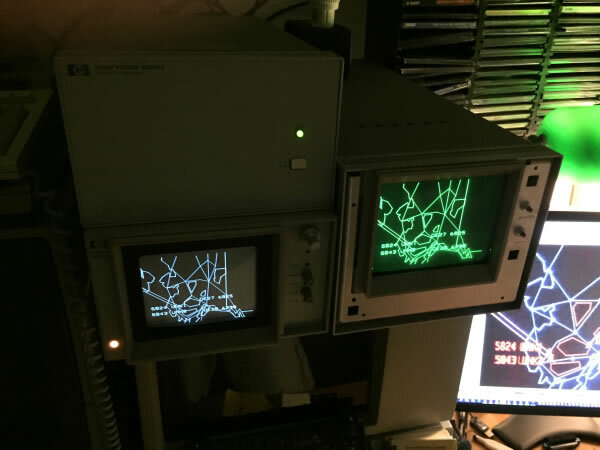 A vector generator prototype from 1983, a high resolution XY display from 1982, and a HP 9845C workstation as controller. For convenience, I connected to 1347A to a standard PC via GPIB interface, and wrote a small program to send a couple of commands to the vector generator. But what was still missing was content. There were no floppy discs with the original software or data included, so I had to create all that stuff on my own. I intended to use Inkscape for that puropose. It's open source, it's cool, and it's free. And it offers a plugin mechanism to produce whatever you like instead of SVG as output. The existing HPGL plugin however was not of much use, since it is intended for cutting plotters. So I wrote my own Python plugin to translate SVG to the language the 1347A understands. Plus an interpreter which translates HPGL to the raw format used in the 1347A vector memory. Because with the raw data you have a gain in speed of one or two orders of magnitude. I created some of the more frequently used maps (World Map, Polar Map, North America Map and some regional maps) by using the scenes from the movie as templates, and converted them to plot arrays (for the HP 9845C workstation), to HPGL (for slow plotting on the vector generator and on the 9872 plotter) and to 1347A raw format (for very fast vector generation). I used layers within Inkscape to separate the different colors, so it is easy to export the color separated graphics as well as to create full colored graphics for the HP 9845C. So I had the images on the vector generator and on the XY display. Next step now was to automate things. Since I have no custom Mitchell camera, I dropped that part. But I got a color filter wheel, and a small kit with stepper motor and driver originally intended for use with a Raspberry Pi and Arduino. Just as the Raspberry and the Arduino, the HP 9845C supports GPIO with the 98032 16-bit interface. 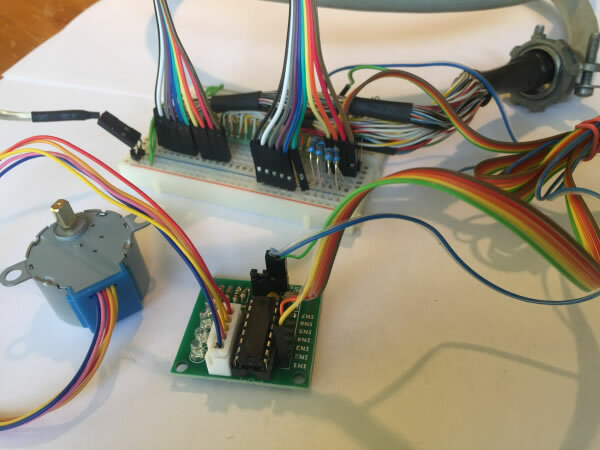 I used a breadboard to put everything together and wrote a small program on the HP 9845C for controlling the stepper motor. Instead of the Mitchell camera I used a GoPro which - unfortunately - cannot be controlled remotely (not ideal anyway because it uses a wide angle lense). 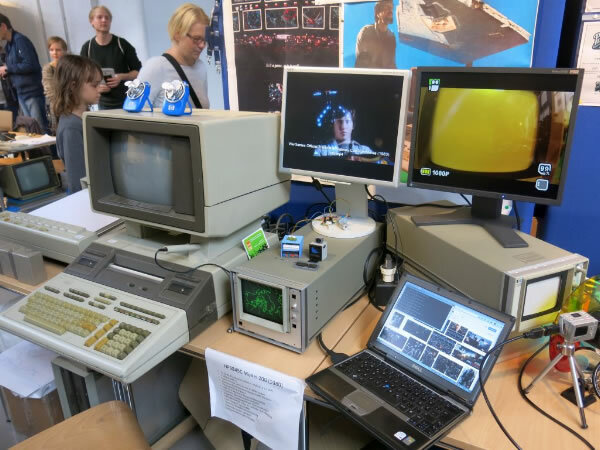 I transferred the whole setup to the Vintage Computing Festival in Berlin on October 6, and we had lots of fun there showing the original equipment in action. 34 years after the movie was taken (see this link for a report on the VCFB 2017). Below are 9845C produced scenes taken from the movie.